A beautiful and serene environment has been created with a modern blend. The architectural lines are fresh and blend seamlessly with the environment. The design and lush lands merge contemporary Eastern and Western influences and incorporate the fabulous rainforest setting. If tranquility is what you are after then you will enjoy many peaceful moments at Cedar Creek Falls retreat. You can also stroll around the grounds or along the mountain stream which you can see from our balconies and find numerous locations within the 12 acre property to spend time to relax in peace. 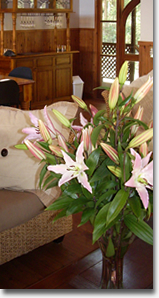 You can also relax by one of 4 log fires or in the main lounge room with a good book and a glass of red wine. The retreat is also the ideal venue for personal development groups, yoga retreats and courses. You can simply drift away while gazing into our fabulous log fires. Four separate buildings with connecting timber decks. We offer internet access for our executive clients. Waterfalls and crystal clear rock pools. Pristine rainforest with magnificent nature, vegetation & wildlife. The perfect place to re-energise amongst nature, whilst allowing your group to focus on their work.